Knowing where to look for records is crucial to finding them. 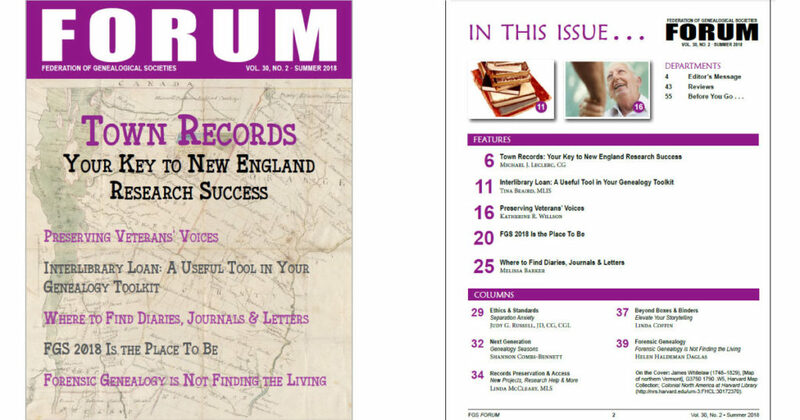 In “Town Records: Your Key to New England Research Success,” Michael J. Leclerc, CG, explains the local government structure you need to know for successful research in New England. In “Interlibrary Loan: A Useful Tool in Your Genealogy Toolkit,” Tina Beaird, MLIS discusses why accessing resources held in distant libraries doesn’t necessarily require a road trip. The FGS website will be switched to a new platform soon. To ensure that FGS member society leadership and FORUM individual subscribers have access to this latest issue during this transition, we emailed a direct link to the Summer 2018 issue of the magazine. Current FGS Member Society Leadership: The email with the direct link to the magazine was sent to the main contact for each member society. Board members and FGS delegates of member societies have access to the magazine through the society’s membership. If your organization is an FGS member and you did not receive the link, please email forum@fgs.org. Current FGS FORUM subscribers (individuals): The email with the direct link to the magazine was sent to the email address on file for each subscriber. If you are a FORUM subscriber and you did not receive the link, please email forum@fgs.org. Who can subscribe to FORUM? Anyone. You don’t have to be a member of a genealogical society in order to subscribe. Genealogical Society Leaders: If your society is not a member of the Federation of Genealogical Societies, become one today and let your society’s leadership begin accessing FORUM and its 25+ year archives which is just one of the many benefits of FGS membership.